The lithium battery case is made of aluminum sheet 3003 h14 alloy material. The 3003 aluminum sheet is mainly used on square lithium batteries. The reasons why lithium batteries are packaged in aluminum cases are light weight and safer than steel shells. 3003 deep-drawn aluminum sheet has good formability, mainly used for deep-drawn materials, it has excellent forming processing characteristics, high corrosion resistance, good weldability and electrical conductivity. The aluminum shell is usually made of 3003 aluminum-manganese alloy. The main alloy components are Mn, Cu, Mg, Si, Fe, etc. These five alloys play different roles, the effects such as Cu and Mg are to improve strength and hardness, Mn to improve corrosion resistance, Si to enhance the heat treatment effect of magnesium-containing aluminum alloy, and Fe to improve high temperature strength. 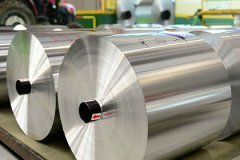 The use of aluminum sheet 3003 for lithium battery casing alloy material construction has significant safety performance considerations, and this safety performance can be expressed by the material thickness and the bulging coefficient. The reason why the aluminum case can be made thinner is the lithium battery of the same capacity is lighter than the steel case. From the working mechanism of the lithium battery, during charging, lithium ions are deintercalated and the positive electrode expands in volume; during discharge, lithium ions are embedded from the positive electrode and the negative electrode is expanded; both of which cause solid expansion, and the bulging coefficient can be reduced by a suitable alloy formulation. Because of the above relative advantages, the aluminum sheet 3003 h14 lithium battery shell is currently the mainstream of liquid lithium batteries, and is used in almost all fields. The light weight and safety and the resulting performance advantages make the lithium battery aluminum casing the mainstream of the casing.